Raw materials were procured from M/s. Maharishi Ayurveda Pharmacy, Noida and authenticated by Dravyaguna expert/Botanist, while the metal/minerals were certified by Rasa Śāstra experts. The	composition	of	the	formulation	is	mentioned	in	[Table 1]. The drug was prepared in the following steps. Levigation of the blend with specified liquids and converting into tablet. Preparation of Rasa Sindhura involves preparation Kajjalī, BhāvaNā (levigation) with Vaṭāṅkura jala (decoction of leaf buds of Ficus benghalensis Linn.) and processing in vāluka yantra Annexure 1 [Additional file 1]. Kajjalī was prepared by triturating equal quantities i.e. 180 gm each of Hiṅgulottha Pārada Annexure 1 (Mercury obtained from cinnabar) and Śuddha Gandhaka (processed sulphur) in a khalva yantra (mortar pestle), till the formation of a black coloured, soft, lustreless fine collyrium like powder.,,, This was further levigated with Vaṭāṅkura jala and then dried. This was filled in a strong amber coloured kāca kūpī (glass bottle) in Vāluka yantra (heating device) and subjected to increasing heat gradually. 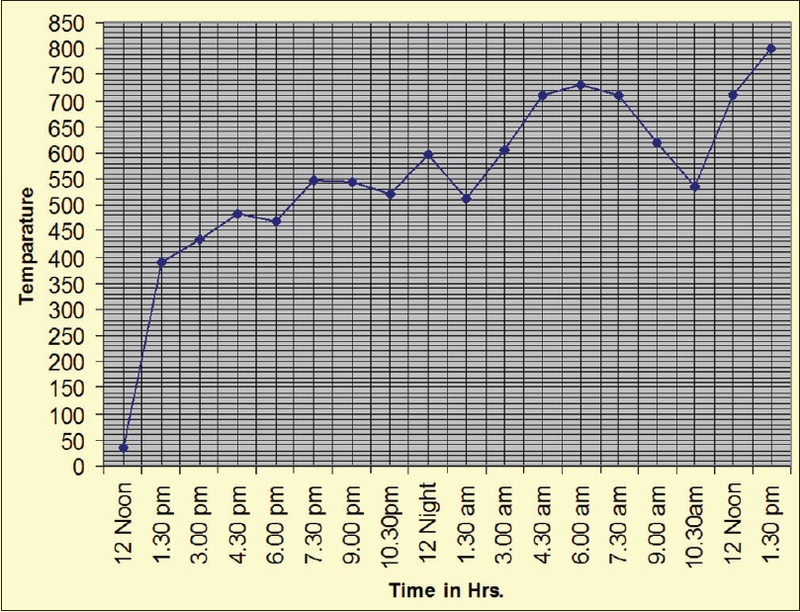 Mild heat was applied for first 6 hours, followed by moderate heat. When the bottom of the bottle became red, the mouth of the bottle was blocked with cork and sealed with mud mixed with lime and jaggery smeared cloth. This was followed by application of strong heat for the next six hours. Thereafter, the Vāluka yantra was allowed to cool down on its own [Figure 1]. The bottle was then removed from the Vāluka yantra and the mud smeared cloth was scraped out using a knife. The bottle was broken down carefully to collect crystallized Rasa Sindhura of 180 gm from the neck of the bottle. Vajrābhraka was processed in presence of Triphalā (three myrobalans) decoction by following classical guidelines. This was bundled in a jute bag with 1/4th quantity of paddy and immersed in kāñji Annexure 1 for 3 days, followed by thorough rubbing in Kāñji, so that fine Abhraka particles can enter into the liquid. The settled down contents known as Dhānyābhraka were collected carefully by decanting the liquid. Svarṇa patras were heated till red hot and immersed consecutively in Tila taila, takra, kāñji, gomūtra and decoction of the seeds of kulattha. This was amalgamated by triturating with Śuddha pārada. 95 g of śuddha svarṇa patra was placed in a śarāva along with half quantity of Gandhaka and covered by another śarāva. This sampuṭa was dried under sun and subjected to a puṭa with 30 cow dung cakes adding one part of Gandhaka each time. The process was repeated 14 times and 90 g. of Svarṇa bhasma was obtained. Molten Nāga was poured consecutively in Tila taila, takra, kāñji, gomūtra and decoction of the seeds of Kulattha for three times each in all the liquids. This was further collected in an iron pan and heated. On melting; powders of Cincā tvak (Tamarindus indica Linn.) and Aśvattha tvak (Ficus religiosa Linn.) were sprinkled in small quantities and stirred with loha darvi (Iron spatula). This process was continued till the molten Nāga is reduced to powder form. 165 g of jarita Nāga was added to equal quantity of Manaḥśilā and levigated with kāñji; small cakrikās were prepared, dried and placed in śarāva sampuṭa and subjected to ardha gaja puṭa Annexure 1. This process was repeated 60 times and 135 g. of Nāga bhasma was obtained. 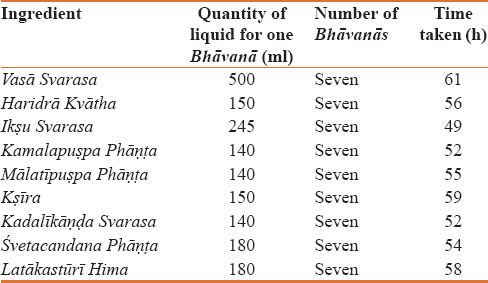 All above ingredients were mixed together (1.305 kg) thoroughly to make a uniform blend and levigated with nine BhāvaNā dravyas inan end runner [Table 2]. At the end of this, 1.895 kg of contents were carefully collected, shifted to a tray drier and dried at 50°C. Dried material was shifted to tablet section and granules were prepared. 2% talcum powder was added to the granules and compressed into tablets of 125 mg size by passing through a Rotary Tablet Punching Machine. Physicochemical analyses, viz. estimation of loss on drying, ash content, acid insoluble ash, water/alcohol soluble extractive, p H, etc., qualitative/quantitative elemental testing, residual pesticide, microbiological examination and tablet parameters viz. hardness, friability, average weight, dissolution time etc., were carried out by following standard methods as per Ayurvedic Pharmacopoeia of India (API) guidelines.,,,,, The quantitative estimation of heavy metals viz. Pb, Cd, As, Hg and Cr was carried out by Atomic Absorption Spectrometer (Perkin Elmer (USA) Analyst 400) and the other elements viz., Mg, Cu, B, Mn, Al, were analyzed on ICP-AES (Thermo Electron Corporation's model Iris Intreprid II XDL). However, Sulphur, Silica, Sn, Au, Ag, Fe, Zn, and Ca, were quantified by using conventional methods. Sample preparation: 2 g powder each of three batches of VKR were soaked overnight separately in 20 ml of methanol. The solutions were continuously stirred for 6 hr and kept for next 18 hr and then the filtered samples were dried and made into 10% solution. High Performance Thin Layer Chromatography was performed on TLC plates pre-coated with 0.25 μm thin layers of silica gel 60 F254(E. Merck). 10 μL methanolic solution of formulation (three batches) were applied on the plates as bands 8.0 mm wide by use of a Linomat-V applicator (CAMAG, Switzerland) fitted with a 100 μL syringe (Hamilton, Switzerland). The application positions X and Y were both 10 mm, to avoid edge effects. Linear ascending development to a distance of 80 mm with mobile phase-Toluene: Ethyl acetate: formic acid 10:3:1 (v/v)was performed in a twin-trough glass chamber previously saturated with vapours of mobile phase for 20 min. The plates were dried in air and visualized under 254 nm and 366 nm for ultra violet detection and the fingerprints were taken. The same TLC plate was also derivatized with anisaldehyde-sulphuric acid reagent and visualized in white light. Powder X-ray diffraction (XRD) analysis was carried out using Rigaku Ultima-IV X-ray diffractometer with CuK α radiation (λ=1.54 A°) operating at 40 kV and 30 mA. Pattern was recorded for angle (2θ) ranging from 10-100 degree at a scanning rate of 1 degree/second and scan step of 0.1 degree. XRD pattern of VKR (3 batches)is shown in spectra. Sample identification was done by matching d-spacing with the standard database. The organo-leptic observation shows that the prepared VKR is a Brown colored tablet with aromatic odour and bitter, astringent taste. The qualitative analysis shows positive tests for the presence of Mercury, Tin, Gold, Silver, Iron, Zinc and Calcium. Chemical analysis revealed presence of 6.27% of Tin, 10.79% of Mercury, 2.89% of Sulphur, 5.66% of Iron, 3.67% of Gold, 4.47% of Silver, 9.5% of Calcium, 4.95% of Zinc, 1.196% of Magnesium, 1.05% of Lead and 2.08% of Silica with other trace elements such as Aluminum, Manganese, Copper, Boron, Chromium, Cadmium and Arsenic etc., Moisture content (4.18%), total ash (57.61%) is left after burning of organic/volatile matter (39.29%), water soluble (13.54%) and alcohol soluble (11.48%) extracts were evaluated (all these values are average analytical values of three batches). The drug was tested for residual pesticides and microbiological examination and they were found to be in permissible limits [Table 3]. HPTLC revealed presence of organic constituents from plant material [Figure 2] and [Table 4]. 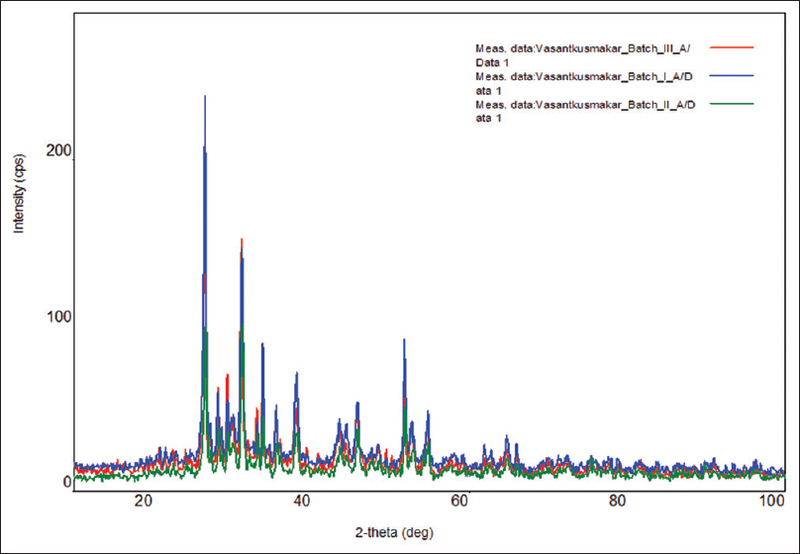 The XRD patterns of the three batches of VKR as shown in spectra are nearly identical. Batch II showed slightly different phases. 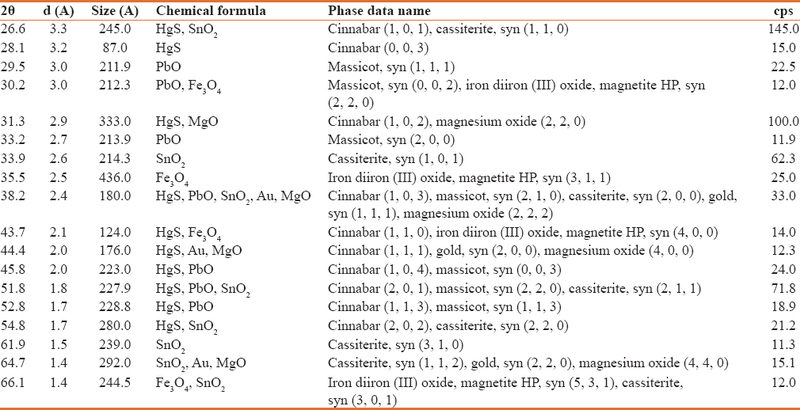 XRD results as shown in [Table 5] indicate that all the samples contained cinnabar (mercury sulphide added as Rasa Sindhura); cassiterite (tin oxide, Vaṅga Bhasma); and, Massicot (lead oxide; Nāga bhasma) and Magnetite (di-iron oxide; Loha bhasma). 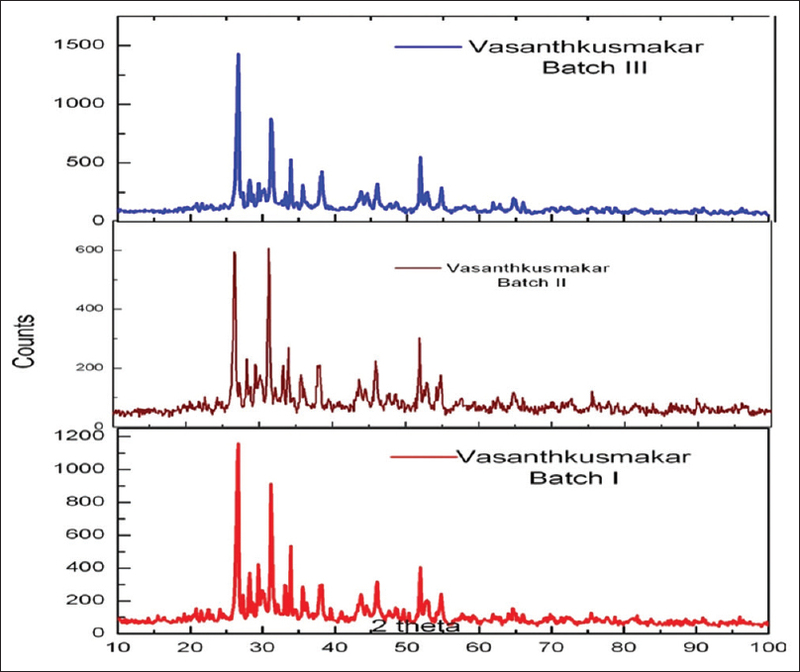 No signature of Raupya or Svarṇa Bhasma could be identified in these spectra, indicating that the methods used for their preparation, did not yield any crystalline products or their signature is buried under the strong lines of other constituents. The XRD lines at 38.3, 44.4 and 64.7 degrees could show the presence of elemental gold. This has to be examined under light microcopy, for the presence of any shiny particles, which, if present, can indicate the reduction of Svarṇa bhasma added into metallic gold in the presence of organics. Elemental chemical analysis has shown the presence of gold and silver. 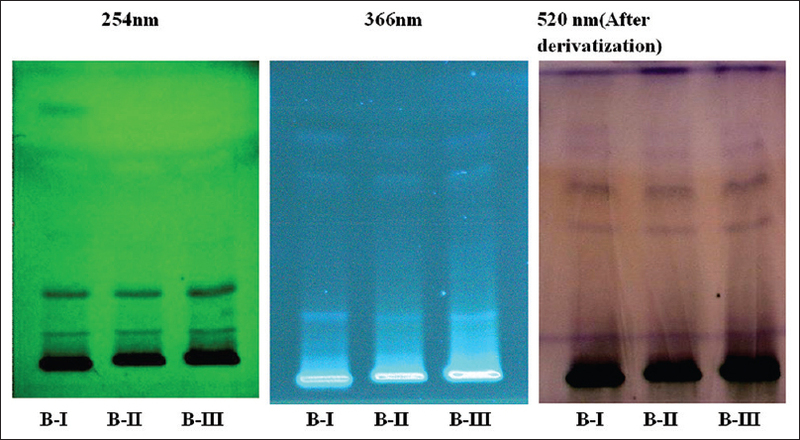 The crystalline form of Abhraka bhasma appears to be not present [Figure 3] and [Figure 4]. Despite the addition of Pravāla bhasma and Mauktika piṣṭi (essentially Calcium carbonate) has not shown any crystalline form such as aragonite or calcite in the XRD pattern despite high presence of calcium in the chemical analysis. The presence of crystalline magnesium oxide is not explained by the added inorganic chemicals in the preparation of VKR. It can be seen that the three XRD patterns on the samples are qualitatively same in the relative intensities of the peaks. The assay of total ash content in these samples (app. 56% - 59% almost matching the expected fraction of inorganic constituents by weight) and the XRD results indicate that the inorganic contents have remained intact over time. The physico chemical analysis reveal that VKR prepared by following classical guidelines is very effective in converting the macro elements into therapeutically effective medicines in micro form. Well prepared herbo-mineral drugs offer many advantages over plant medicines due to their longer shelf life, lesser doses, easy storing facilities, better palatability etc., The inferences and the standards laid down in this study certainly can be utilized as baseline data of standardization and quality assurance of this herbo-mineral formulation. It will be helpful laying down the further pharmacopoeial standards of Vasantakusumaākara Rasa. The Authors express heartfelt thanks and would like to acknowledge Dr SK Sharma, Former Advisor (Ayurveda), M/o AYUSH, Govt. of India, Dr MM Padhi, Former Dy. Director General, CCRAS and Dr Pramila Pant, Assistant Director (Chemistry) for valuable guidance, Dr VK Singh, M/s. Maharishi Ayurveda Pharmacy, Noida for technical inputs. The authors are thankful to Dr J Arunachalam, Former Director, National Centre for Compositional Characterization of Materials (BARC), Hyderabad for helping in data analysis and interpretation of the results. Thanks are also conveyed to Bhavana Dwivedi, Dr. Aarti Sheetal, Suman Singh, Divya Mishra and Yadunandan Dey, Senior Research Fellows of CCRAS for technical assistance. Bhatt G, Mitra N. Paradvishya, Hindi Commentary. Rasendra Sara Sangraha. 4th ed. Varanasi: Motilal Banarasidas Publication; 1976. p. 631. Das G. Rasyana Adhikar. In: Haridutt S, Vaidya L, editors. Bhaisajaya Ratanavali. 7th ed. Varanasi: Motilal Banarasi Das; 1988. p. 758. Das G. Premha Adhikar. In: Haridutt S, Vaidya L, editors. Bhaisajaya Ratanavali. 7th ed. Varanasi: Motilal Banarasi Das; 1988. p. 469. Das G. Bahumutra Adhikar. In: Haridutt S, Vaidya L, editors. Bhaisajaya Ratanavali. 7th ed. Varanasi: Motilal Banarasi Das; 1988. p. 484. Sharma S, Shastri K. Taranga 06, Hindi Commentary. Rasatarangini.11th ed. Varanasi: Motilal Banarasidas Publications; 1979. p. 229. Shastri A. Vagbhatta, Adhyaya-08, Hindi Commentary. Rasaratna Samuchchaya. 9th ed. Varanasi: Amarbharti Prakashan; 1995. p. 135. The Ayurvedic Formulary of India (AFI). 2nd ed., Part I. New Delhi: Ministry of Health and Family Welfare, Govt. of India, The Controller of Publications; 2003. p. 372. Sharma Mishra SG, Upadhyay M. Adhyaya 3, Hindi Commentary by Ayurvedaprakasha. Reprinted. Varanasi: The Chowkhambha Vidya Bhawan; 2008. p. 30. The Ayurvedic Formulary of India (AFI). 2nd ed., Part I. New Delhi: Ministry of Health and Family Welfare, Govt. of India, The Controller of Publications; 2003. p. 348. Sharma S, Shastri K. Taranga 23, Hindi Commentary. Rasatarangini.11th ed. Varanasi: Motilal Banarasidas Publications; 1979. p. 627. Sharma S, Shastri K. Taranga 06, Hindi Commentary. Rasatarangini.11th ed. Varanasi: Motilal Banarasidas Publications; 1979. p. 627-8. Sharma S, Shastri K. Taranga 10, Hindi Commentary. Rasatarangini.11th ed. Varanasi: Motilal Banarasidas Publications; 1979. p. 225. Sharma Mishra SG, Upadhyay M. Adhyaya 2, Hindi Commentary. Ayurvedaprakasha. Reprinted. Varanasi: The Chowkhambha Vidya Bhawan; 2008. p. 289-90. Sharma S, Shastri K. Taranga 10, Hindi Commentary. Rasatarangini.11th ed. Varanasi: Motilal Banarasidas Publications; 1979. p. 229. Vidyasagar PS. Sharangadhara, Dhatusodhan-Marna Kalpana, Madhyama Khanda –Adhayaya 11. Sharangadhara Samhita. 5th ed. Varanasi: Chaukhamba Orientalia; 2002. p. 241. Sharma S, Shastri K. Taranga 16, Hindi Commentary. Rasatarangini.11th ed. Varanasi: Motilal Banarasidas Publications; 1979. p. 387. Sharma S, Shastri K. Taranga 16, Hindi Commentary. Rasatarangini.11th ed. Varanasi: Motilal Banarasidas Publications; 1979. p. 392-3. Mitra N, Bhatt G. Paradvishya, Hindi Commentary. Rasendrasarasangraha. 4th ed. Varanasi: Motilal Banarasidas Publication; 1976. p. 63. Sharma S, Shastri K. Taranga 20, Hindi Commentary. Rasatarangini.11th ed. Varanasi: Motilal Banarasidas Publications; 1979. p. 495-6. Sharma S, Shastri K. Taranga 16, Hindi Commentary. Rasatarangini.11th ed. Varanasi: Motilal Banarasidas Publications; 1979. p. 496-7. Sharma S, Shastri K. Taranga 16, Hindi Commentary. Rasatarangini.11th ed. Varanasi: Motilal Banarasidas Publications; 1979. p. 497-8. Sharma S, Shastri K. Taranga 16, Hindi Commentary. Rasatarangini.11th ed. Varanasi: Motilal Banarasidas Publications; 1979. p. 498-500, 502. Jha CB. Adhyaya 04, Yantropkaran Prakaran. Ayurvediya Rasashastra. Varanasi: Chaukhamba Surbharati Prakashan; 1994. p. 106. Vidyasagar PS. Sharangadhara, Dhatusodhan-Marna Kalpana, Madhyama Khanda –Adhayaya 11. Sharangadhara Samhita. 5th ed. Varanasi: Chaukhamba Orientalia; 2002. p. 245. Sharma S, Shastri K. Taranga 18, Hindi Commentary. Rasatarangini. 11th ed. Varanasi: Motilal Banarasidas Publications; 1979. p. 438. Upadhyay M, Sharma Mishra SG. Adhyaya 3, Hindi Commentary. Ayurvedaprakasha. Reprinted. Varanasi: The Chowkhambha Vidya Bhawan; 2008. p. 379-80. Sharma S, Shastri K. Taranga 23, Hindi Commentary. Rasatarangini.11th ed. Varanasi: Motilal Banarasidas Publications; 1979. p. 612. Sodhanmarna Prakrana. Ayurved Sara Sangrah. 7th ed. Kolkata: Sree Baidyanaath Ayurved Bhavan; 1971. p. 145. The Ayurvedic Pharmacopoeia of India. 1st ed., Part I., Vol. 1. New Delhi: Ministry of Health and Family Welfare, Govt. of India, The Controller of Publications; 1990. The Ayurvedic Pharmacopoeia of India. 1st ed., Part I., Vol. 3. New Delhi: Ministry of Health and Family Welfare, Govt. of India, The Controller of Publications; 2001. The Ayurvedic Pharmacopoeia of India. Minerals and Metals. 1st ed., Part I., Vol. 7. New Delhi: Ministry of Health and Family Welfare, Govt. of India, The Controller of Publications; 2008. The Ayurvedic Pharmacopoeia of India. 1st ed., Part II., Vol. 1. New Delhi: Ministry of Health and Family Welfare, Govt. of India, The Controller of Publications; 2007. The Ayurvedic Pharmacopoeia of India. 1st ed., Part II., Vol. 2. New Delhi: Ministry of Health and Family Welfare, Govt. of India, The Controller of Publications; 2008. Pharmacopoeial Standards for Ayurvedic Formulations. Revised Edition. New Delhi: CCRAS, Ministry of Health and Family Welfare, Govt. of India, The Controller of Publications; 1987.